Many artists are unsure how to bridge the gap between the many basic 'how to draw' books and the more advanced ones dealing with the esoteric details of composition, perspective and anatomy. 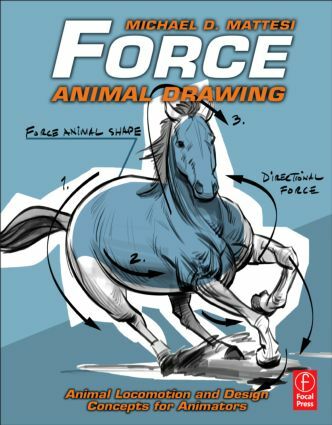 Force: Animal Drawing is the comprehensive guide to developing artistic animals that are creative, dynamic and anatomical, bridging the gap between foundational art and advanced techniques. Artists and animators alike all find animal inspiration when animating characters - be they human or inhuman. For a unique 'larger than life' character, readers will learn to apply the unique facets of animal movement, locomotion, expressions, facial features, physical build and personality to their traditional and digital art. Readers will also adapt key industry tricks and techniques to personify animal animations with key characteristics of a human's face. Mike Mattesi is the Director of the Entertainment Art Academy based in Southern California. He has been a professional production artist and instructor for almost 20 years with clients including Disney, Marvel Comics, Hasbro Toys, ABC, Microsoft, Electronic Arts, Dreamworks and Nickelodeon.